Basic SWAT Tactical Medic, this course is designed to create tactically sound medics who will support police SWAT teams and other tactical operations. During the course tactical medics are taught proper tactical medic skills combined with proper tactics. The tactical medic course places a high focus on personnel who wish to be assigned to a Tactical Emergency Medical Support (TEMS) team. 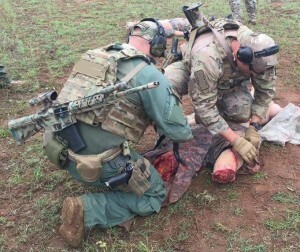 Conducted in conjunction with 911TACMED, the Tactical Combat Casualty Care (TCCC) course introduces evidence-based, life-saving techniques and strategies for providing the best trauma care on the battlefield. NAEMT conducts TCCC courses under the auspices of its PHTLS program, the recognized world leader in pre-hospital trauma education. NAEMT’s TCCC courses use the PHTLS Military textbook and are fully compliant with the Department of Defense’s Committee on Tactical Combat Casualty Care (CoTCCC) guidelines. It is the only TCCC course endorsed by the American College of Surgeons. The TCCC-MP (TCCC for Medical Personnel) course is designed for combat EMS/military personnel, including medics, corpsmen, and pararescue personnel deploying in support of combat operations. NAEMT’s TCCC course is accredited by the Continuing Education Coordinating Board for Emergency Medical Services (CECBEMS) and recognized by the National Registry of EMTs (NREMT). EMT BASIC Certification and above. This course will utilize live fire and force on force drills, students must be in good physical condition. (Other medical certifications are accepted on a case by case basis). There will be a pass/fail physical assessment the first day of class. Students should show up for class in PT gear -bring clothes to change after. Students failing the physical assessment receive a certificate of attendance rather than a certificate of completion. The PT test is the Cooper “Single Cut-Point” standard: 1.5 mile run in 16:28, 300 meter run in 1:11, 25 push-ups in 1 Minute, 29 sit-ups in 1 minute. Firefighters / Medical Personnel – Weapons may be provided, bring 300 rounds of 5.56 ammunition and 200 rounds of 9mm ammunition – NO RELOADS. Simmunitions / UTM and protective gear will be provided. © 2013 Special Operations Systems, LLC. All rights reserved.